This parmesan chicken recipe is made from chicken, Parmesan, egg, and nothing else. A great weeknight dinner from the pantry. This satisfying weeknight supper is a simple chicken recipe. Just roll chicken cutlets in grated Parmesan may not win you any points with your stodgy, fine-china-and-silver-every-night-of-the-week mother-in-law. But we find it to be a superlative solution when it’s 10 minutes past when the kids started bellyaching that they’re hungry for dinner and you finally yank open the refrigerator and there seems to be nothing in there. Take a glance at this recipe and then look in the fridge again. We know you’re in a hurry. But a word to the wise. Actually, a few words. 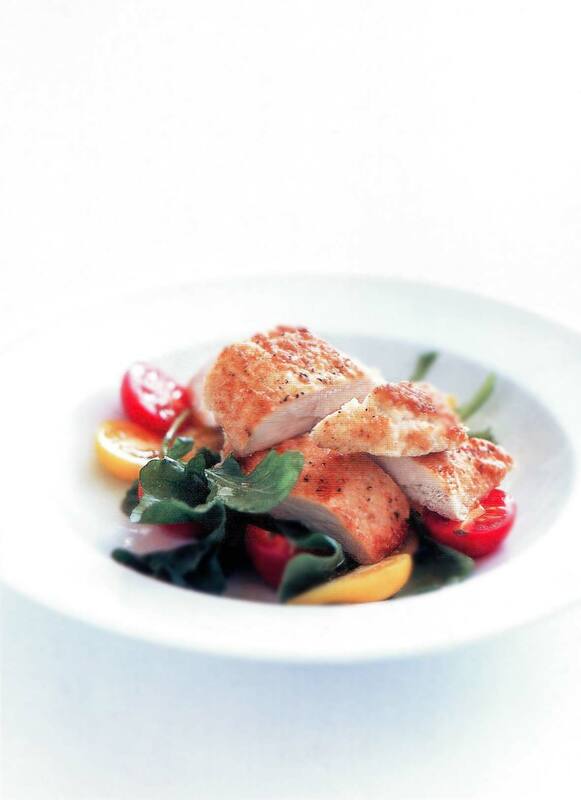 First, don’t ignore the instructions in the chicken recipe below to pound the chicken breasts to an even thinness. It may take a few more moments that you swear you don’t have, yet it ensures the chicken cooks quickly and evenly, saving you time (and running out for take-out) in the long run. Another thing to be careful of is to grate the Parmesan finely—use those really tiny holes on the grater–as tiny shreds of cheese have a stick-to-itiveness that larger pieces just can’t muster, which means the cheese stays put on the chicken, not the pan. Last, if you’d rather not heat up the kitchen, rather than bake the chicken in the oven you can sear it in a well-seasoned cast-iron or nonstick skillet that’s just barely slicked with olive oil. All you need is a thin metal spatula (trust us on this) and impeccable timing so as to flip the cutlet the moment the cheese crust goes from gooey to crisp. 1. Preheat the oven to 400°F (200°C). Line a baking sheet or baking dish with parchment paper. 2. Place the egg whites or whole egg in a shallow dish and beat lightly. Place the Parmesan on a plate and, if you like pepper, add some to the Parmesan and toss to coat. Dip the chicken breasts first into the egg, allowing any excess to drip off, then drop it in the Parmesan and turn it to coat, pressing the Parmesan onto the chicken to make it stick. Place the Parmesan-crusted chicken on the parchment. 3. Bake until the chicken is golden and cooked through, about 15 minutes. Slide onto plates immediately. If desired, serve with a simple salad of greens or herbs and tomato dressed with olive oil. Let’s get this out of the way right off the bat: I’m not a chicken breast kind of eater—or cook. I can’t remember the last time I bought a boneless, skinless chicken breast. But when, on a weekday morning, I knew I’d be working late that night and this recipe landed in my e-mail inbox, it did seem like the perfect answer to the “What on earth will I make for dinner?” question since I had everything on hand except for the chicken. The recipe worked quite well as written, with the one minor detail that my chicken breasts weren’t quite done after 15 minutes in the oven—18 minutes did the trick. (The cooking time will naturally vary a little bit based on the overall size and the shape of the meat you buy.) The final dish was a chicken breast that was perfectly cooked and moist but rather plain. The recipe suggests an arugula and tomato salad to go with it, and I served an arugula salad but no tomato, as mine are not ripe yet. It was a good match, but some ripe summer tomatoes would have really added to the dish.It works, and it’s very, very easy to make. Perhaps one of the easiest things that I’ve made in more than 25 years of cooking. And that’s the key. I may not be a big fan of a simple chicken breast, but my health-conscious, non-cooking husband is. When we came to the all-important question, “would you make this again?” his answer was that he would make it himself, because it was better than any chicken breast he had cooked in the past, and it was really easy. So there you have it. A good, foolproof way to get a nice, healthy dinner on the table. 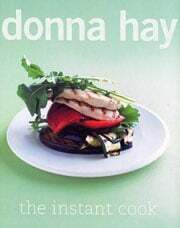 Parmesan-Crusted Chicken Recipe © 2004 Donna Hay. Photo © 2004 Con Poulos. All rights reserved. All recipes and photos used with permission of the publisher. This sounds yummy to me. I’d probably have to cook it longer too, high altitude here seems to make us have to cook everything a little longer. I baked it for 20 minutes here (I’m a five minutes longer if it doesn’t look quite right kinda girl lol). I doubled the recipe with no troubles, as we are a family of five. It was simple to make and every member of the family had seconds. This is going into meal rotation here. LOVED this dish! Very easy to make and tasty too. Only problem I had was that in cooking it longer to achieve the golden brown crust, the chicken dried out a little. :( Any suggestions? hey cristy, glad you liked the flavor! you know, i’ve relied on this quick weeknight fix for years, and the way i make it is on the stovetop, not in the oven. it’s a little trickier, with the converse situation at play here, as the cheese turns golden and brown really quite quickly. in order to make sure the chicken isn’t underdone in the short amount of time it takes the cheese to crisp, it needs to be pounded really quite thin. i’d suggest you either splurge on super skinny chicken cutlets or simply bash the heck out of boneless, skinless chicken breasts. i place the chicken between sheets of parchment and have at it with a rolling pin or a big old cast-iron skillet until the chicken is about 1/4 inch or so. (also useful in working out the kinks of a long day at work!) use a mediumish to medium-highish heat. and make sure that parmesan is grated on the fine edge of the grater. when it’s golden and crisp, it will release easily from the skillet, preferably a really well-seasoned cast-iron skillet. let me know how it goes! If you have the time, you could make a simple brine and place the chicken into it for about 3 or 4 hours. Remove, rinse and pat the pieces dry before continuing with the recipe. Question: Are only the egg whites used out of health concerns, or is there some other alchemy at work in only using the whites? I’m not sure, though I am the kind of person inclined to do a side-by-side comparison of white-only versus whole egg. Comparisons aside, I’m more likely to try to use one whole egg, rather than two egg whites, in order to avoid finding something to do with the yolks so as not to waste them. If I do end up doing a taste test I’ll be sure to come back and report! Audrey, I’m quite, quite confident that the Parm chicken will be lovely either way. And, in a happy coincidence, should you find yourself with a leftover yolk or four, lookee what we have for you, a simple vanilla bean ice cream that folks are saying is the creamiest, dreamiest thing they’ve ever made. Lucky for me I have no stodgy, fine-china-and-silver-every-night-of-the-week mother-in-law but I do have kids who bellyache for really delicious yet simple food. And Parmesan on anything is a favorite. This is so being made for dinner this week. I make these all the time but instead of an egg wash, I brush some Duke’s mayonnaise on the chicken before rolling it in the cheese. Gotta love that Dukes mayonnaise right, Mike? Mayonnaise is a great way to help keep chicken and fish moist during baking. Thanks for your tip! I pity those who can’t get Duke’s. Mike, I’ve never heard of Duke’s mayonnaise until recently–and that’s all I’m hearing now. I’m getting my hands on some pronto and seeing what all the chatter is about. Duke’s is a Southern thing. I was born and raised in the Deep South but my family moved around extensively, hence, I was raised on Hellman’s/Best Foods. It was decent, dependable and readily available everywhere. It wasn’t until my 40’s that providence smiled on me and I found my way back to Dixie, where I had my “Road to Damascus” experience with Duke’s. Hellman’s/Best Foods has long been relegated to the culinary garbage heap along with Kraft and Miracle Whip. It causes me to have conniptions to mention the last two in polite society. yep, Dukes is a Southern thang (South Carolina, if I remember correctly) and like you, Mike, I love it! Duke’s is made in Richmond. No self-respecting Southerner would serve Pimento Cheese made with anything else. Agree, Mike. From Eugenia Duke’s kitchen in Greenville, South Carolina to Richmond, Virginia, Dukes has a long history in the South. This packs a lot of flavor for only requiring a few ingredients. I’m wondering if the complaints stem from using fake Parm. Be sure to use REAL Parmesan cheese (Parmigiano Reggiano)! Sherry, many thanks, that’s a very good point. I have to admit to being similarly perplexed at complaints, but what you suggest makes perfect sense. Thank you!